I think most of us can agree that how a day begins is a large predictor of how the rest of the day will go. Think about it. When you have a bad day, can’t you usually trace its origins back to the first couple of hours? 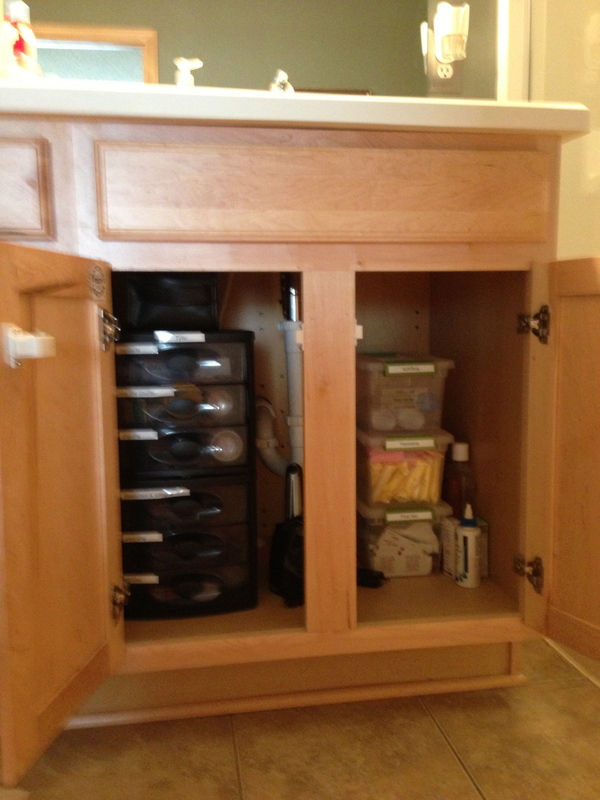 With that in mind, this post is going to focus on the place most days begin (the bathroom), and how I maximize our storage. 2. 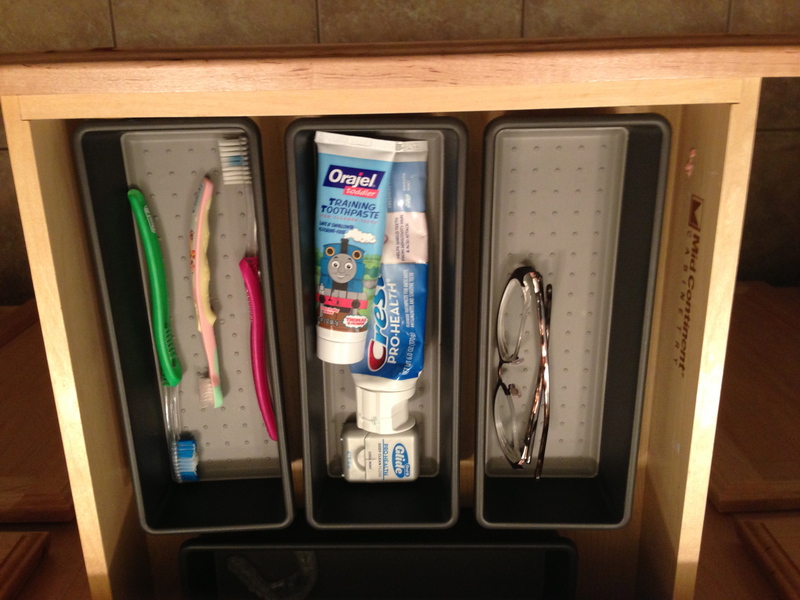 Drawer organizers are used for toothbrushes, tooth paste and floss storage. Confession: hoarding brushes and combs used to be a serious problem for me. A few years back I threw away probably 15 combs and brushes that I didn’t use. Why I was hanging onto those unused combs and brushes like some poor soul from an episode of “hoarders” I still don’t know. I think I, like many, hate the idea of throwing something away that I spent money on, but there is a valuable lesson to be learned when purging drawers, cabinets and closets. DON’T BUY S%#* YOU DON’T NEED! No one needs 6 brushes, 4 picks, and 5 combs. Find one of each that you really like and purge the rest. 2. 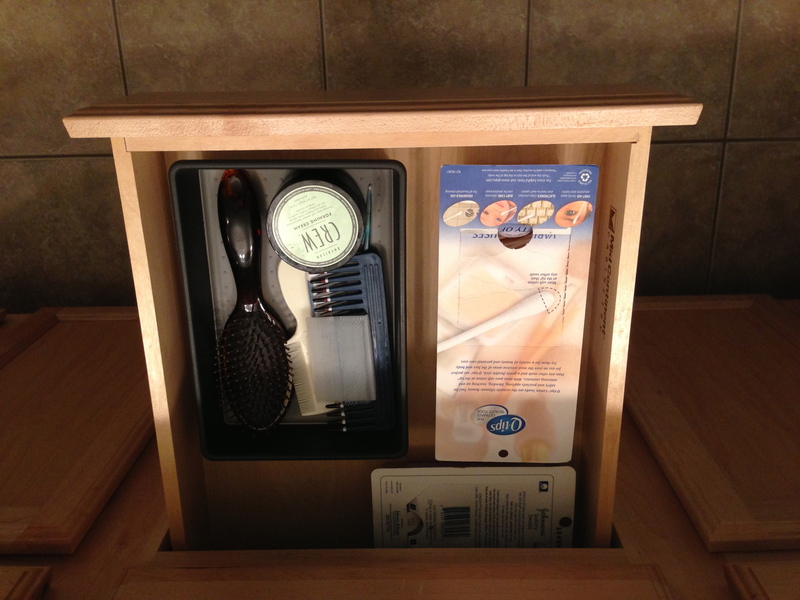 Feminine products are stored in a small tote. For 7 days, this tote can be kept near the toilet; It can be tucked back under the counter for the other 20-some odd days. 3. First aid and seasonal products (sunscreen and bug spray) are also kept in clear, labeled, portable totes. 4. I am a huge fan of stackable, labeled drawer organizers for the purpose of categorizing like items and maximizing vertical space. 5. 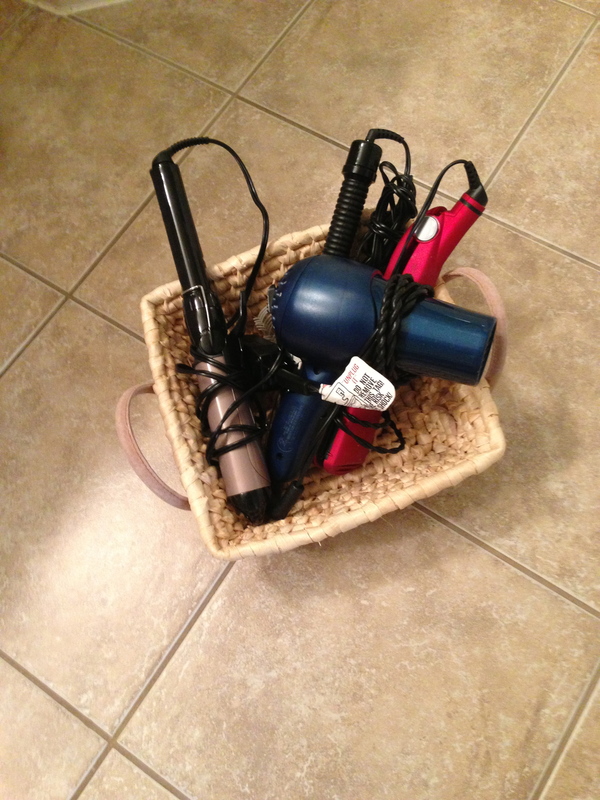 My hair tools (hair dryer, curling iron, flat iron, etc.) are kept in a basket under my sink. I can pull it out when needed and tuck it back under when not. It goes without saying, but must be said – A clutter free, organized bathroom is SO MUCH EASIER to clean! 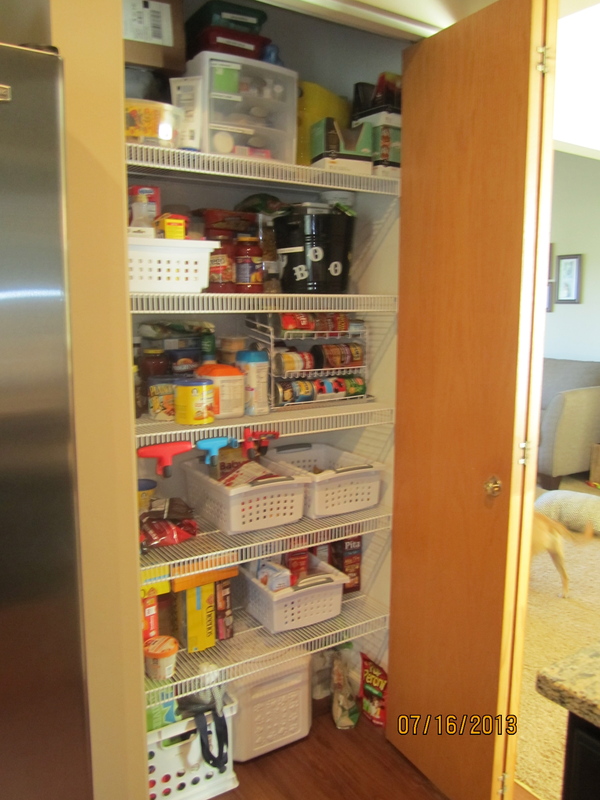 I have always wanted a walk-in pantry, and it was on my must-have list when we were house hunting… I didn’t get one. Boo, hiss. 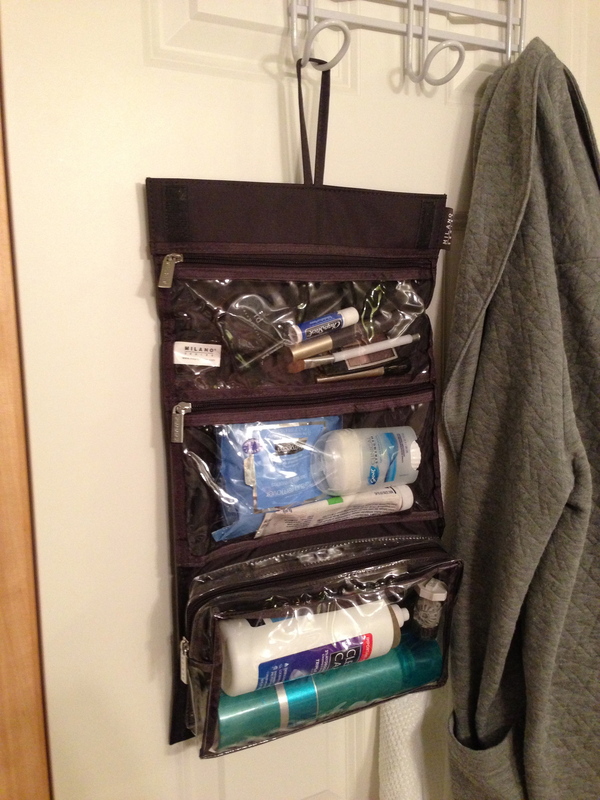 But just because it’s not a walk-in doesn’t mean it can’t be super functional and organized. Not bad. Fairly organized, but still in need of some “Type A” love. It was in need of a fresh coat of paint, and the poorly functioning door, when opened, would close off the doorway to the dining room. So, we emptied the pantry, removed the (poorly functioning) door, and gave it a fresh coat of paint. 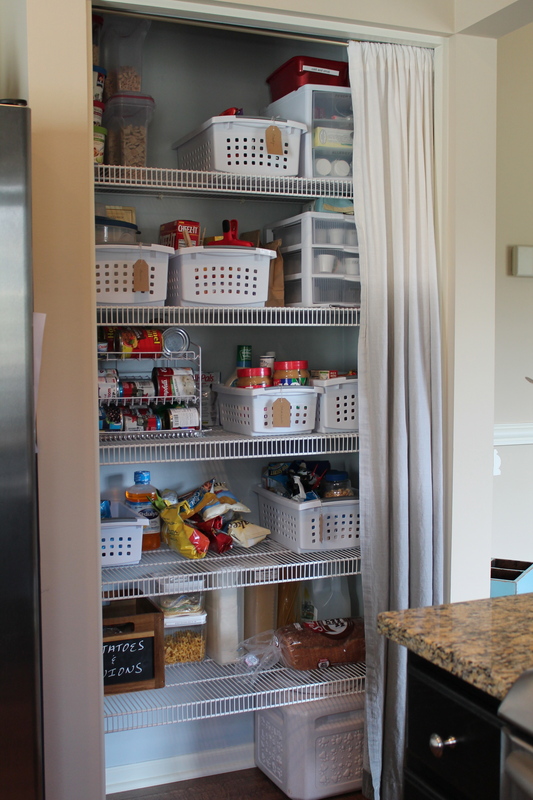 A clean, well organized pantry simplifies meal planning and eliminates over-buying. Win. Win. 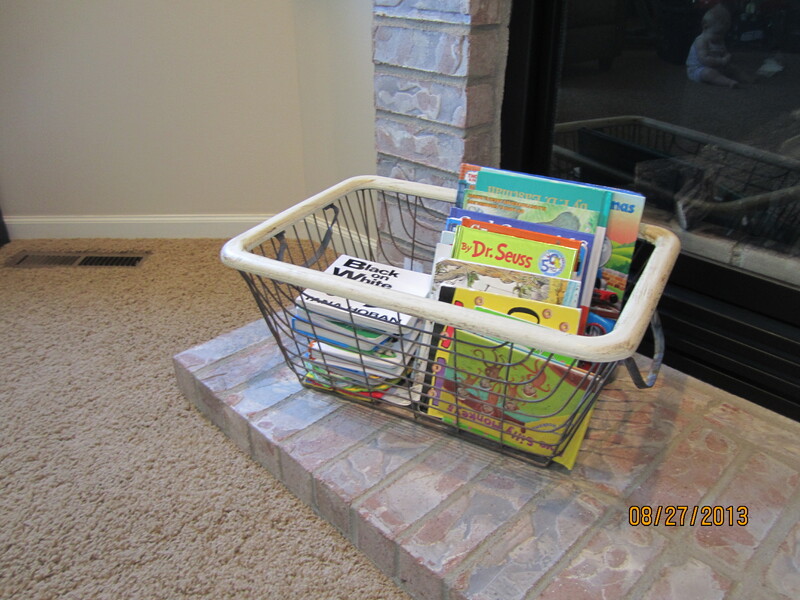 If you have littles in your house, you probably have this problem too… books EVERYWHERE. First, I had them on a shelf… which Rex would clear in one fell swoop. Next, I had them in a cupboard. Out of sight, out of mind. So, I channeled my “inner teacher” and got a basket! It’s easy to see and choose the books, and even easier to put them away. I am simplifying our play spaces. They weren’t functioning the way I wanted them to so I started voraciously reading about Montessori principles. I was immediately captivated by the clean, uncluttered spaces that promoted early literacy, math, self-help, fine motor and rest. After extensive reading, I discovered that I didn’t “buy into” to the Montessori philosophy in its entirety, but that there were definitely aspects that I wanted reflected in our play space. 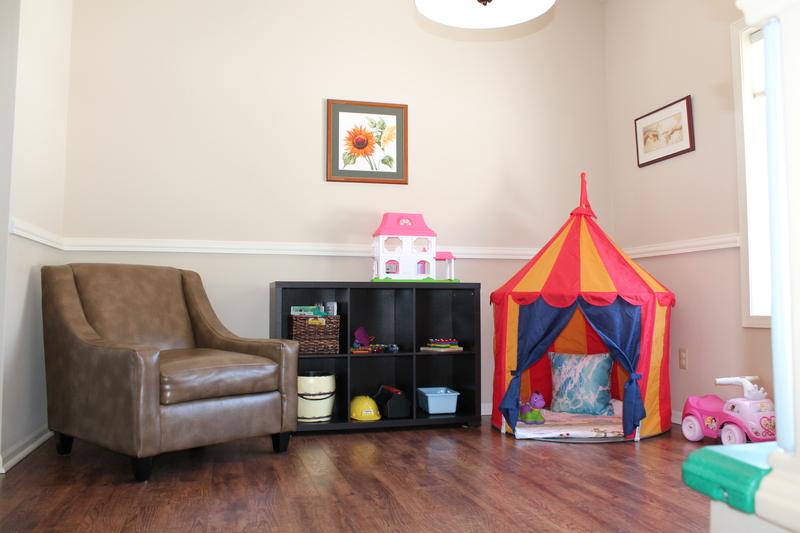 The space should be uncluttered and everything should be easily accessible to little ones. 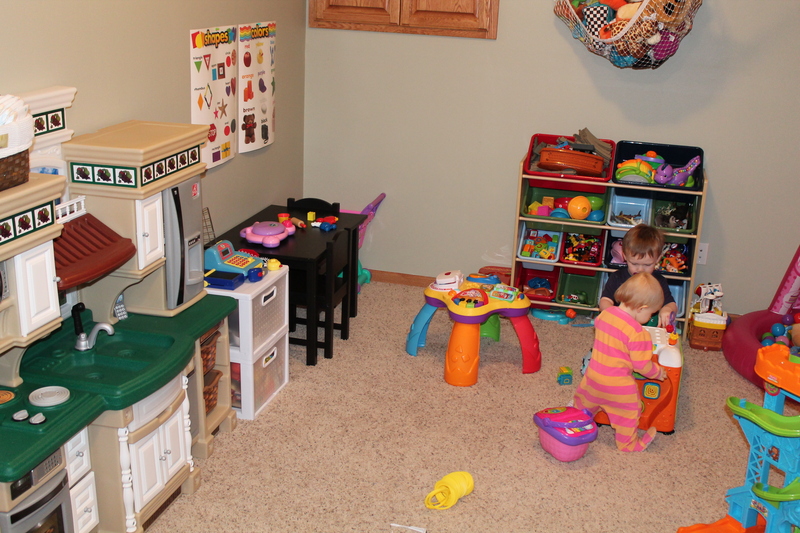 In our previous play space, every toy was accounted for – talk about sensory overload! Kids are kind of like puppies… give them too few toys, they get bored (and destructive); Give them too many toys, they get bored (and destructive). I decided to pare down and start a toy rotation. 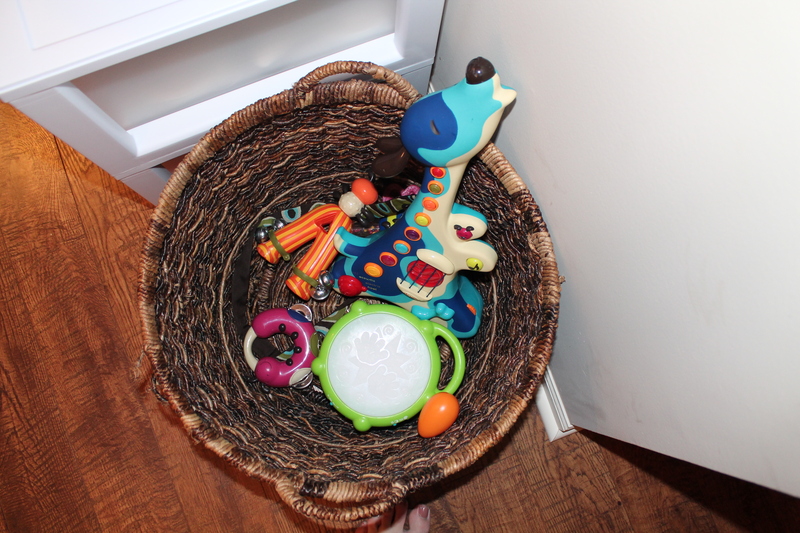 All that is really needed for a good toy rotation is baskets…lots and lots of baskets, bins, and buckets (and a place to store the toys out of rotation). We included a comfy chair with low arms so that the three of us can sit together to read a book or two (or five). 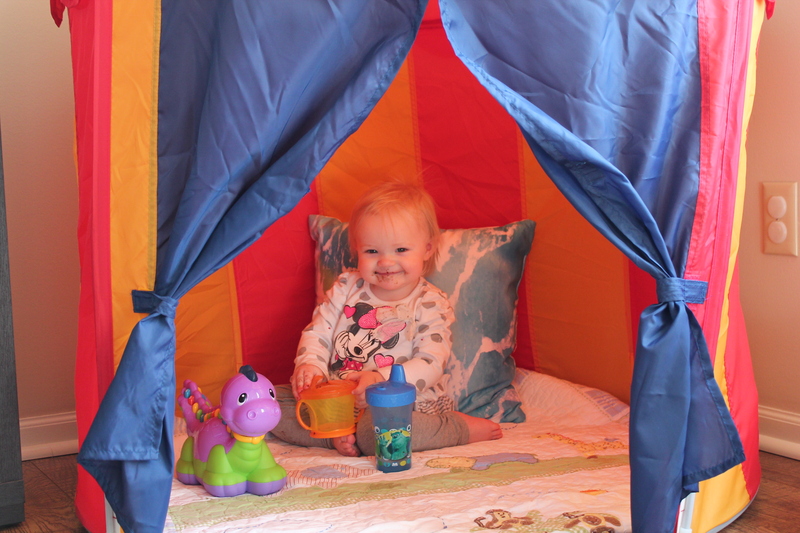 The tent is an all time favorite for my kids. Sometimes they play peek-a-boo from behind the curtain door, and other times they like to sneak away for some quiet time. My favorite is when they go in together and I can’t see them, but can hear them giggling. My least favorite is when they go in together and someone ends up in tears. 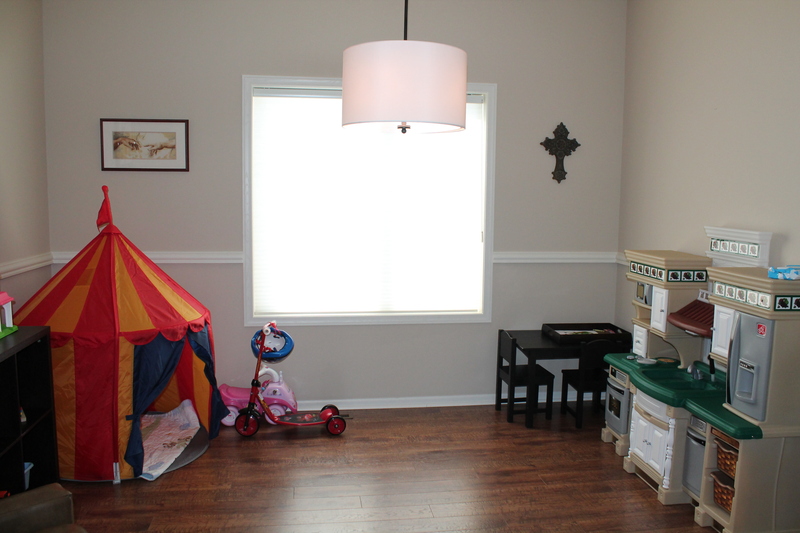 The child-sized table is a perfect spot to do something creative like draw or play with play-dough. The kitchen is a perfect place to “play grown-up,” and a basket of instruments gives them an opportunity to give me a headache make a little music. 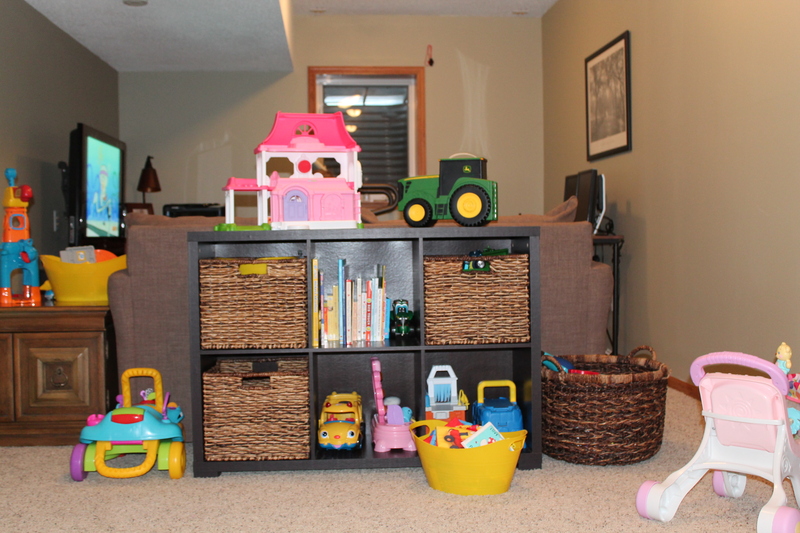 The space should be uncluttered and easily accessible to little ones.